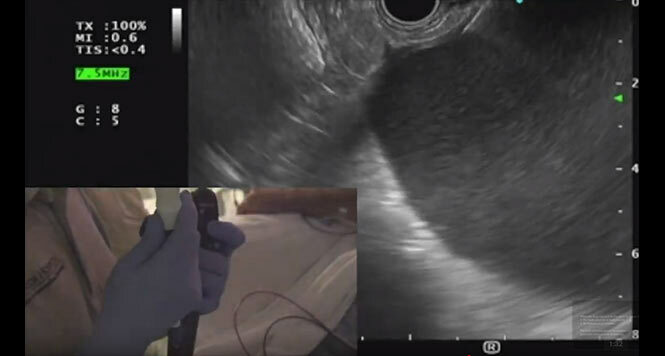 The endoscopic ultrasound device is approaching the distal submucosal tumor. The endoscopic appearance is caused by the oblique lateral view provided by the EUS device. The balloon is inflated. 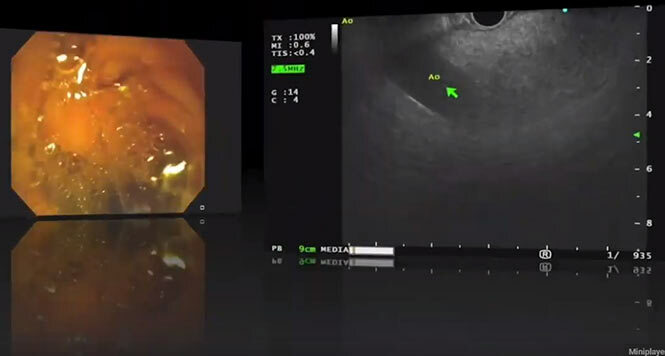 The EUS image is then displayed, and a search is made for the location of the tumor. The lesion now appears at the 11-o’clock position. In terms of its echogenicity, the tumor is hypoechoic. The question now is which layer it originates at. The layer is still blurred externally and not clearly identifiable. It is only on closer examination that the tumor slowly comes into the picture and the outer layer of the muscularis is seen to be separately preserved. In this detailed image, it is mainly a matter of what is called the transitional zone — i.e., the area from which the normal wall develops into the tumor. The tumor here arises from the muscularis mucosa. To the left of this arrow, one can clearly see the two hypoechoic layers of the muscularis propria, which are separated by a hyperechoic layer. However, this layer can become blurred when there is poor EUS contact, so that it looks here as if the tumor is arising from the muscularis propria and not from the muscularis mucosae, as is in fact the case. This can be clarified by making some extra movements of the tip of the device. The diagram shows the implications of the layer of origin that is identified on EUS. Whereas tumors that arise from the muscularis mucosae can be resected endoluminally, if appropriately indicated — using endoscopic submucosal dissection (ESD), for example — tumors that arise from the muscularis propria, particularly when they bulge outward, have to be removed using other techniques such as a tunnel resection in the esophagus.